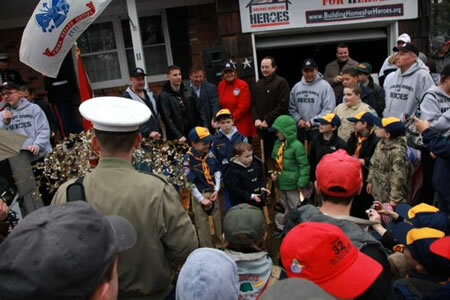 Ground was broken on March 31, 2012 to mark the beginning of a major renovation of the home of USMC Captain James Byler in Huntington, Long Island. The home will meet the many needs of First Lieutenant Byler, who lost both of his legs above the knee, and also lost both pinky fingers when he stepped on an IED while leading his platoon in Afghanistan. The $250,000 home renovation has been made possible through donations and sponsorships secured by Building Homes for Heroes, in partnership with the office of Town of Huntington Councilman Mark Mayoka, and numerous contractors and vendors. Building Homes for Heroes estimates the project completion date to be July 4, 2012.